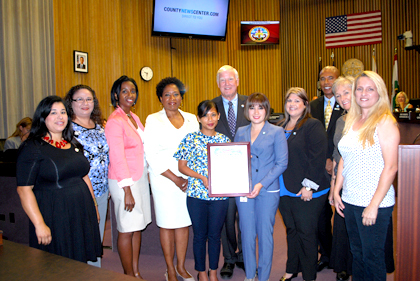 In honor of its diamond anniversary, the San Diego County Employees’ Charitable Organization received a proclamation from the County Board of Supervisors on Tuesday recognizing the nonprofit for its leadership, generosity and commitment to the community. Through County employee and retirees’ donations, CECO has distributed more than $6.7 million throughout the San Diego region to local non-profit organizations and employees in crisis since its founding in 1956. Save the date for CECO’s next anniversary celebration: a lunchtime gathering Friday, Aug. 26 at the County Operations Center. There will be a special star-studded, all-employee band performance with tunes from the ‘50s, when CECO formed, food and other surprise festivities! More details to come. So stay tuned to InSite. To learn how to donate to CECO, visit them online.